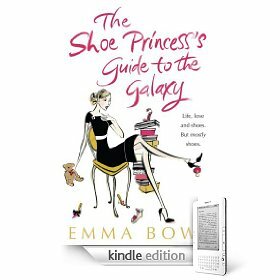 AmazonKindle...the perfect way for a Shoe Princess to surf the galaxy! I’m so very proud to announce that, as of yesterday, SP Emma Bowd and moi officially became part of modern 21st Century history. All thanks to the international launch of The Shoe Princess’s Guide to the Galaxy on the absolutely amazing and stunningly beautiful wireless Kindle by Amazon.com. With a book download taking less than 60 seconds, Shoe Princesses with a Kindle can now delight in The Shoe Princess’s Guide to the Galaxy anytime and anyplace on the planet (…with wireless access!). Oh, and you can also read newspapers, magazines and blogs. Savour the moment SPs…this is the future!